These days, from the corner of Delaware and Sanders, you can see what is arguably Buffalo’s most suburban-looking few blocks of modern development. To the left is Target, Office Max, Moe’s and Applebee’s. To the right is Starbucks and Walgreens. In the late 1950s, the same view included, among other differences, the overpass and tracks of the DL&W Railroad. It was the removal of those tracks — along with Benderson Development’s purchase of the nearby 13-acre Atlas Steel plant, the 8-acre Bucholtz Aviation heliport, and several smaller, Delaware Avenue-facing businesses (including Sher-Del Foods, a self-service car wash, Mr. Oil Change, Kenmore Builder’s Supply and two parcels belonging to Tunmore Oldsmobile) — that allowed for the development of the area to its current level. The building that was the home of Henry’s Food Market has been replaced by the building that was the home of a Goodwill retail store until they moved to 2625 Delaware Ave. in October. 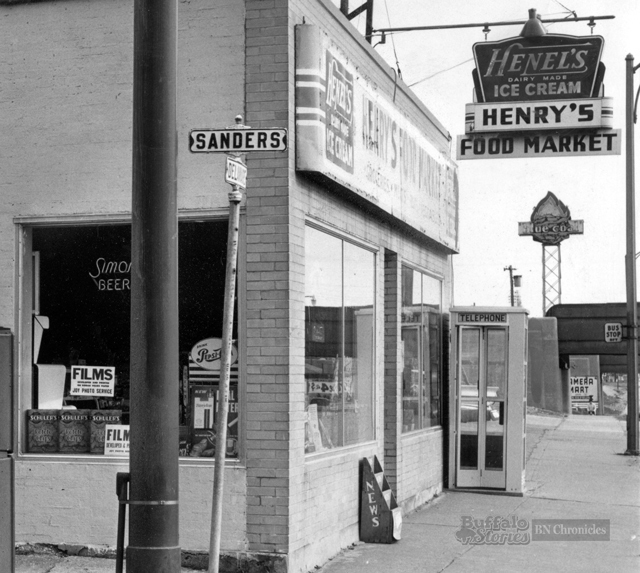 Henry’s sign is from Henel’s Dairy, which was a few blocks up Delaware in Kenmore near the corner of Delaware and Westgate, just past St. Paul’s Catholic church. The large, high sign for Blue Coal Corp. can be seen beyond the no-longer-in-place viaduct. It stood approximately where Jim’s Steak-Out now stands. The building for Delaware Camera Mart is new, but the business is a long-standing one — it’s the only local business captured in this photo that’s still at it. 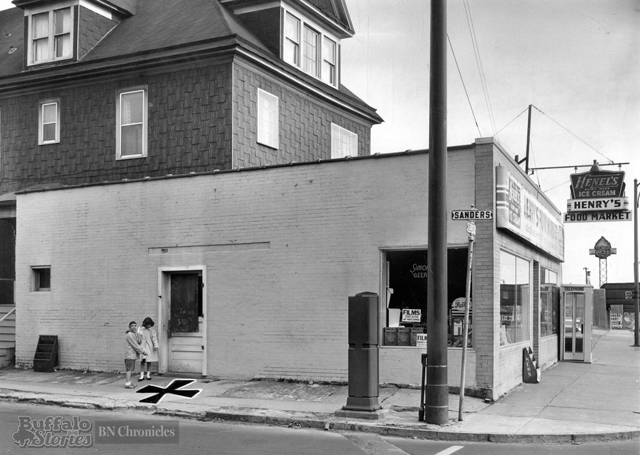 Something else that would look similar both today and in 1959: a car dealership on the opposite corner of Sanders. In 1959, it was Tunmore Oldsmobile. Today, it’s a Basil used car lot.